Placerita white oil gushes from the New Century Oil Co.'s well No. 1 in Placerita Canyon at a rate of 100 to 200 barrels per day. It was much like the typical gusher except for one thing: It gushed white instead of black! 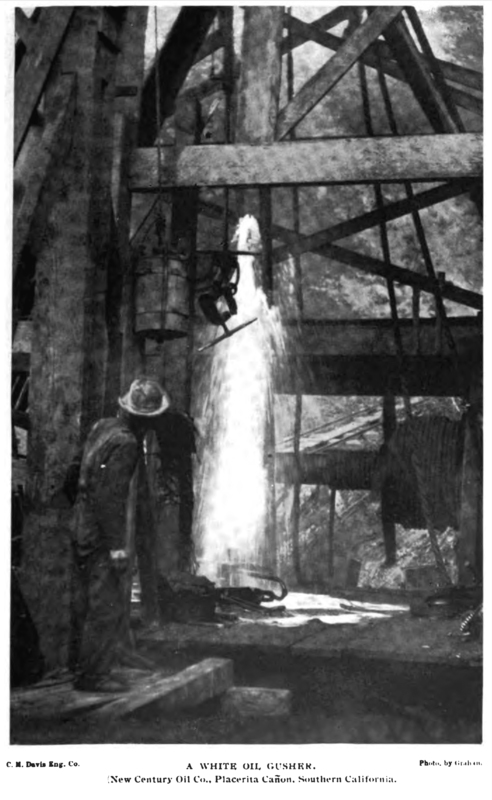 According to a contemporary report, the oil first shot through the casing of this well  the second productive well in the area  on Aug. 25, 1900, and leveled off to 40 barrels per day by the end of that same year ["The Land of Sunshine" magazine, Vol. 13, No. 6, December 1900. Charles F. Lummis, Ed.]. Subsequent sources suggest the flow continued to slow. While this might look like an artist's rendering, it is an actual photograph as published in the September-October 1900 edition of Lummis' "The Land of Sunshine" magazine. Looking through the derrick, one can see a set of rails leading up the hill behind it. Based on information from George Starbuck IV (a younger relative of property owner Frank Walker), that would be the track for a funicular that led 100 feet uphill to Freeman & Nelson's 1899 discovery well. Today this derrick is gone, but Placerita white oil continues to bubble up from its casing, which Starbuck estimates to be just a few feet below ground. It's located along the present-day Canyon Trail in Placerita Canyon State and County Park. Special thanks to local historian Stan Walker (no relation to Frank Walker) for calling our attention to this image. LW2257a: 9600 dpi jpeg from .pdf copy of magazine cited.